So you wanna get your MBA. Woo! Making the decision to go to business school is the first big step in what may feel like a long journey ahead. Here’s some advice: If you’re looking for the best way to take some weight off your shoulders and move forward confidently, attend an MBA Tour. In reality, attending an MBA admissions event could be the difference between getting accepted and getting denied, given you do the proper research and plan ahead. Check out these top 6 reasons you should attend an MBA tour, make copies of your resume, put on your best professional attire, and dive into your future. If you want an MBA, this word is going to follow you around for the rest of your life, so you might as well make friends with it. Being comfortable with networking will not only help you get into business school, it’ll get you a good job, promotions, and, most importantly, a bigger paycheck. 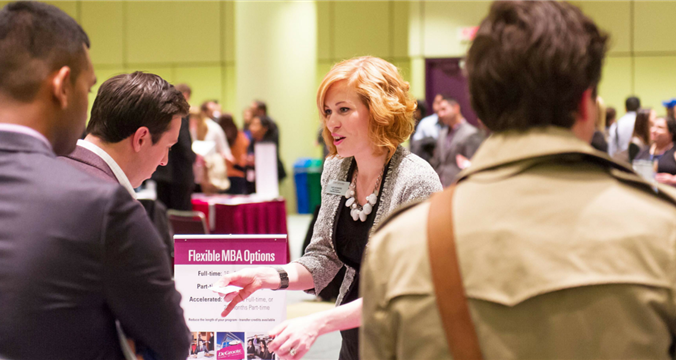 MBA fairs are the perfect opportunity to flex your networking muscles in preparation for campus visits and interviews. Use this as a chance to get comfortable talking to admissions officers and MBA alumni from your target schools. If you tend to feel timid about approaching people you don’t know, bring a friend for a boost of confidence. Keep in mind that proper preparation before the event will also help shake your nerves. If you’re a bit more bombastic, reign it in a little. Approach with a smile, strong handshake, and succinct personal introduction. It’s okay to be confident and outgoing, but always remember to be polite. If you don’t show up to the MBA tour with a mental (or written) list of questions you need answered, you’re doing it all wrong. Prepare topics of conversation for admissions consultants, officers, and alumni. Remember, each person you talk to has unique knowledge to impart, so don’t be afraid to get specific. What is the strength of your school’s program? What teaching method do most professors employ? What kind of work experience do you most value? What other schools did you consider and why did you choose this one? What clubs and special events are available for students? What is the best way to address possible weaknesses in my application? What schools should I be looking at given by background and experience? Is an MBA even right for me? We recommend you attend an MBA tour with an open mind. Even if you’ve already decided whether you want to attend a full-time or part-time program or have chosen your primary target schools, it’s wise to explore all your options when you have the opportunity. By keeping your options open, you may find that getting an EMBA is the best route for you after all... or you could discover an international program that’ll blow your previously made-up mind. We strongly recommend you use the MBA tour as a chance to widen your horizons by gathering as much information as possible. This will ultimately help you make the best, most educated decision about your future. Financing is often the biggest concern for those dreaming about getting an MBA. If this applies to you, use the MBA tour to gather knowledge on scholarships you may qualify for. The Bad News: Scholarships likely won’t cover the entire cost of your tuition. The Good News: MBA fair are a great opportunity to learn about loans and other financing options. Attend expert panels and speak to officers in order to better understand the different forms of financing available. Some tours offer exclusive scholarships available to those who attend their events. MBA fairs are your chance to meet admissions consultants who will review your application and advise you on how to stand out while applying. This is the part where we come in! Did you know that by attending an MBA tour you will meet experts who are waiting to help you craft the perfect business school application? If not, we’re glad you found us. Each year, the Admit.me team participates in events such as the QS World MBA Tour and The MBA Tour to help MBA wanna-bes put their best foot forward while applying. Whether you meet with Admit.me or another admissions counselor, your application will be better for it. Even if none of your target schools are coming to an MBA tour near you, there is still value in attending. Use the fair as your opportunity to get comfortable talking to admissions officers, especially if they aren’t representing a program of interest. Consider this your chance to hone your skills in a no-pressure environment. When the stakes are low, you will feel more comfortable trying out your elevator pitch and exploring the best way to present your personal brand. Test different ways to articulate the reasons you are pursuing your MBA, as you will surely be asked this question by your target schools down the road. While this may feel like a lot to digest, remember that the MBA tour is simply the first step in many applicants’ MBA journey. After the fair, be sure to solidify any connections you made by sending thank you notes or emails to those who offered you their time. Make future plans by scheduling campus visits and staying up to date on future events. Stay in touch with students and alums from your target schools. And remember, with Admit.me you’ll Never Apply Alone.